Today I have for you a super-duper quick one pan meal. 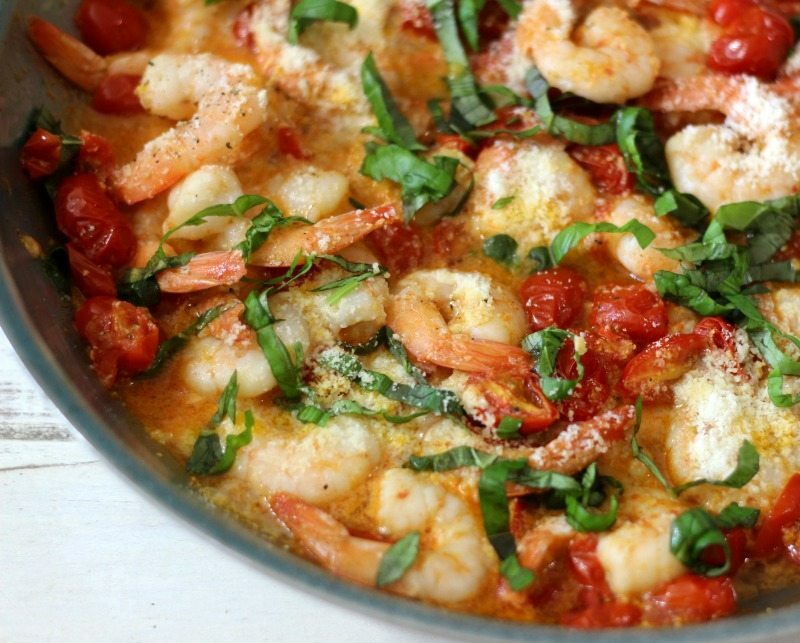 It’s rich, savory and has pure Italian flavors; it’s my Shrimp with Garlic and Tomatoes. This dish is so good. It tastes like something that you would get at an Italian restaurant. 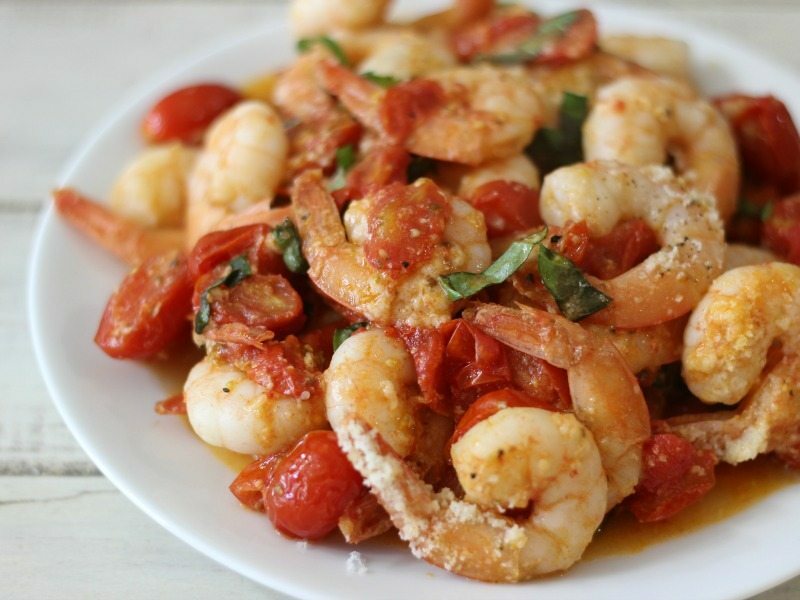 The tomatoes give this recipe a wonderful natural tomato sauce that is full of garlic flavor. It kind of reminds me of shrimp scampi. The Parmesan Cheese really adds an extra boost of flavor and gives it a little bit of saltiness. I threw this together as a random recipe. 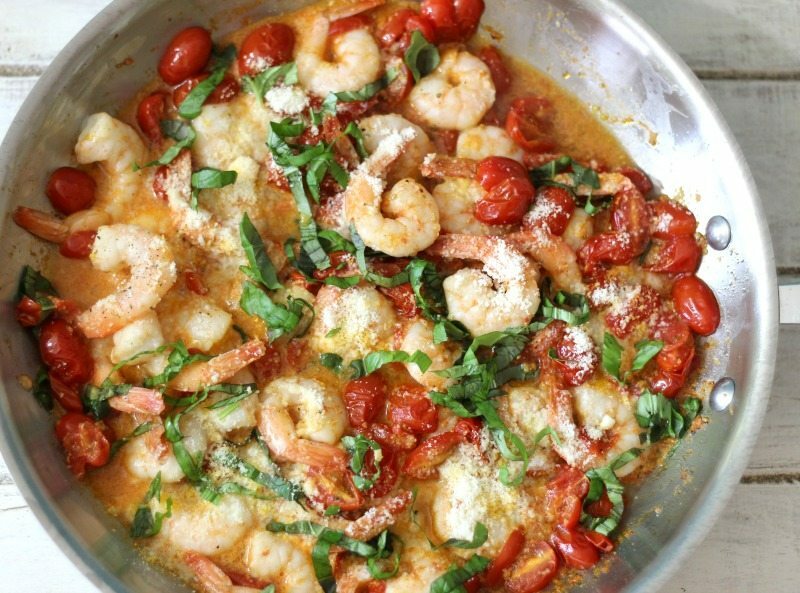 I had 1 pound of cherry tomatoes that I had to use up, and the only protein that I had, was shrimp, so I thought why not? It’s a perfect combination. This would be wonderful served with a side salad or some crusty bread. We had it for dinner on Sunday. I love that it is a quick meal. The whole thing took under 20 minutes to make and that includes the prep. It serves 4 people or 2 really hungry people. The calories for each serving is only 137. Not to shabby. I don’t feel so guilty having bread with it. You can dip the bread in the sauce. Yum! 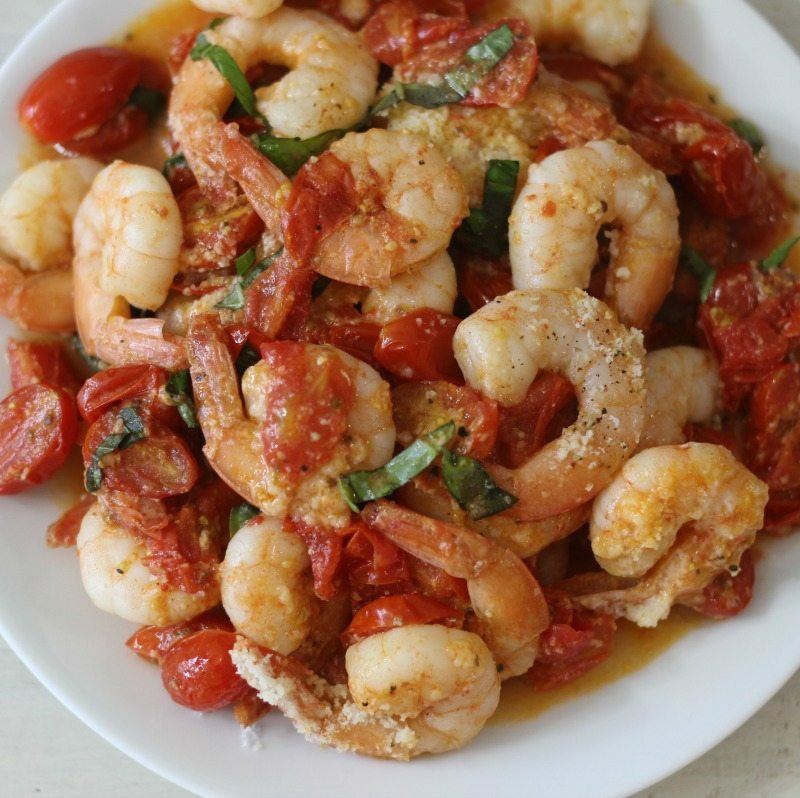 a quick one pan meal Italian dish with sauteed tomatoes, garlic and shrimp which has been topped with Parmesan cheese. In a skillet, over medium-low heat add olive oil, and garlic. Saute for about 1 minute. Add tomatoes with a pinch of salt and pepper and cook until the tomatoes start to blister; about 5 minutes. Add shrimp and cook until shrimp is no longer pink. Take off the heat and top with Parmesan cheese and basil. Serve immediately. Take the tail off the shrimp for easy eating. This really does make for a fabulous dish. I have been watching Giada on Food Network and she makes such wonderful dishes, she inspired me on this one. Simple, easy ingredients and robust flavor, Who can ask for anything more?